In our last post, we discussed what pipe labels need to look like. 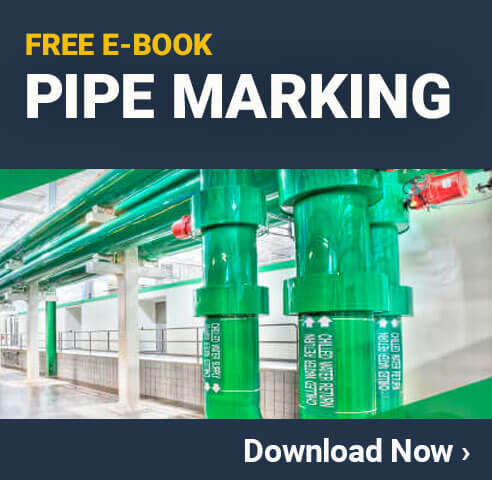 They need to follow the ANSI/ASME 13.1 industry standard for pipe marking, meaning they need to conform to certain color scheme and size guidelines. Now, let’s take a look at where to put pipe labels. Making a plan ahead of time for where you need to place pipe labels will allow you to print or purchase the correct number. You won’t waste time making extra labels or ordering more if you run out. In what locations are the pipe labels needed (on straight runs, changes in direction, etc.)? To what part of the pipe should a label be attached in those locations (top, bottom, side, etc.)? In both cases, you’ll want to put yourself in the place of workers or visitors to your facility. Where will they be standing? Will they be able to read the labels from those locations? ANSI/ASME offers some general guidance for pipe label placement that we’ll examine more closely. The first point—at 25 to 50-foot intervals on straight runs—ensures that if someone needed to determine the contents of a pipe he or she would not need to travel too far. The other three points provide clarification in locations where a pipe’s contents might be questionable because of some change in the pipe. When you’re evaluating your facility to determine where pipe labels are needed, keep an eye out for these four locations. Better yet, get out a map of your facility to help you keep track of pipes and their contents. Once you know which locations need pipe marking labels, stop and consider one more thing before you attach any labels to pipes. Where will employees be standing, and how can you place labels so they’re in a person’s line of sight? Ideally, labels will be placed so that a person working in or entering an area will be able to read them. As you can see in the image above, sometimes placing the label above or below the pipe’s centerline makes it easier for people to read. Attaching a label directly on the bottom or side of a pipe might actually make a label more difficult to see. Just make sure you think about this when you apply labels. To help you with your pipe-labeling project, you can purchase an industrial label printer for your facility that will allow you to print as many labels as you need, when you need them. Alternatively, you can order pre-made labels if you only need a few to fill in the gaps in your current pipe labeling system. New to pipe marking? Learn more about it in the SlideShare below.